11-12 December: Arrived into Nairobi late on Thursday evening, where I was met and hosted by Anne Itotia rsm Provincial and the community - Sr. Brigid Marnane and Sr. Rose Macharia - at Villa Maria, the Provincial House. Friday, 12 December was Jamhuri Day or Kenya Independence Day so there were big celebrations in the city, which were televised. This provided a good opportunity to learn more about Kenya, particularly the social and political context operative today. 13-14 December: During the weekend I visited the Hospitality House on the same grounds as Villa Maria, to meet the community and some of the Sisters who had arrived for the Provincial Assembly the following week. It was a good opportunity to sit with different Sisters over a cuppa, to hear about their respective ministries in different parts of Kenya. 15 December: Visit to the ‘Comprehensive Care Programme’ (CCC), at the Mater Hospital, for those who are HIV+ and living with AIDS. Sr. Brigid Marnane, Coordinator of the programme and member of the Provincial Leadership Team, organised the schedule which enabled me to spend time with key members of the Team, thereby providing a comprehensive overview of this excellent initiative. The CCC project is located in a separate facility on the grounds of the Mater and is fully supported by the management team of the hospital. There is an atmosphere of peace and calm as you enter the CCC building. Staff members, in their interactions with clients are friendly and respectful whilst also being very professional. A similar approach was obvious in the way that staff members interacted with each other. Also tangible was the strong sense of Team, fostered by the daily morning meeting that includes a short prayer led by a different staff member. Following the reflection there is a news update and responsibilities are shared, in the context of their common vision and ministry. On 1 December the CCC staff had put on an event in the hospital grounds to mark International HIV/AIDS day. It was a tremendous success, meriting the CCC Team, the ‘Outstanding Achievement Team Award’ for 2014, from the Mater Management Board. After spending time with each of the section leaders, I accompanied Barack Onyango one of the CCC social workers, to meet some clients in a section of the Mukuru slum. Barack was doing follow up home visits with women participating in the income generating programme. Each of the five women we met in their homes reflected the difference the programme was making to their lives. The anti-retro viral (ARV) drug regime they are on, combined with a healthy diet has restored them to good health. Additionally through selling vegetables or other produce on a small scale, each one is assisting her family to become financially independent. Two of the women shared that their partners who previously abused them, were now treating them with respect. Barack explained the importance of regular visits to everyone in the programme to offer support, guidance and in some instances provide extra funding. Mater Hospital: Mr. Joe Vaughan, the Medical Director took me on a tour of the hospital. The friendly, professional atmosphere combined with the excellent services e.g. MRI and new state of the art cardiac equipment, has contributed to the Mater being ranked the third leading hospital in Nairobi. There are six Mercy sisters working in different areas of the Mater. The hospital financially supports the Paediatric Cardiac programme, also on the hospital grounds, in addition to the CCC HIV/AIDS project. Additional funding is sourced from other donors. This has been the policy of the Mercy Sisters since the Mater Hospital was established. It is modelled on Catherine McAuley’s practise to provide health or educational facilities for the rich, in order to ensure that those who could not afford to pay were also given the love and service they needed! Visit to the Makadara Clinic, a satellite clinic of the Mater CCC programme. In a short tour of this facility, which is located next to the first Mercy Convent established in Kenya, the same caring and professional service is offered to clients who are HIV+. Staff Members also treat minor illnesses or injuries for patients from the surrounding areas. 16 December: With members of the Provincial Leadership Team (PLT) and Sr. Rose Mogun MMM the facilitator for the workshop, we travelled to the Dimesse Sisters Retreat Centre in Karen for a pre workshop planning meeting. 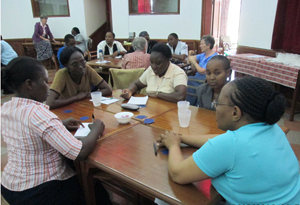 The theme of the workshop ‘Love at the Heart of Mercy’ was agreed at the previous provincial assembly. Denise Boyle fmdm, who presented the workshop, factored the theme into her overview of the Global Action Programme. Using case-studies and symbols she highlighted the root causes underpinning these issues to emphasise the urgency and importance of each of us getting involved, in whatever way possible. Expectations of the workshop were shared and Sr. Rose outlined the schedule for the following days. We closed the session with a reflection from the booklet prepared by the Sisters from the Baraka Community. The Advent themes were highlighted in a beautifully reflective manner, reminding us that it was the Spirit who determined what transpired during our time together! 18-19 December: Each session focussed on a different aspect of the Global Action programme. We moved from the global to local, to highlight the urgent justice issues the Sisters wanted to focus on in Kenya. This led to an exercise to ascertain the four key justice areas the Province would commit to work on in the coming year. We looked at this exercise in the context of the core values agreed during the August Provincial Assembly, 2014.
a. Reviewing if we are ‘just employers’ and also ‘just employees’ in the context of best practice. It was agreed the Province would focus on a) first, possibly with b) running simultaneously. In another session I explained the important work of Global Action through the UN in New York, where Aine O’Connor rsm is the Mercy Representative. During the drafting of the UN Sustainable Development Goals (SDGs) in 2014, Sr Aine mobilised Mercy worldwide, to lobby that the right to water and sanitation is incorporated into the SDG. After the presentation the sisters highlighted the SDGs thought to be most relevant for Kenya. Denise also spoke about the fracking mining process and the proven negative consequences arising from this controversial practice. Throughout the assembly there was good interaction and some lively sessions as we struggled to deal with challenging and difficult issues. 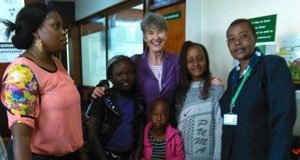 It only remains to thank each Sister, especially Anne Itotia, for facilitating what was an enriching and valuable experience with the Sisters in Kenya.